More than four decades ago, the architectural historian J. M. Freeland (1920-1983) declared the pub to be 'one of the most socially significant, historically valuable, architecturally interesting, and colourful features of Australian society'. This study is underpinned by the same sentiment, although it has neither the ambitious nation-wide geographical scope nor the architectural focus of Freelands The Australian Pub. The pub, the licensed public house, is used here as a vehicle to explore the history of a small part of northern New South Wales. In a way, then, The Gold Digger's Arms by Dr Brett Stubbs is a local history but with a difference, that being its preoccupation with the socially significant, historically valuable, architecturally interesting, and colourful pub. 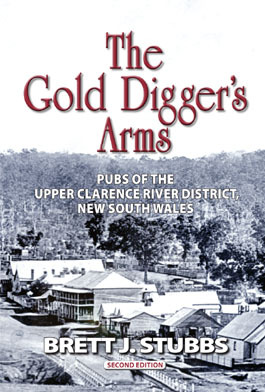 It is at once a history of the Upper Clarence River district of New South Wales, and the story of its pubs. Especially, it explains their comings and goings by reference to the wider history of the district, and to the intricacies of the state-wide liquor licensing system.